For former substance users, the road to recovery is long and winding. Amidst an array of challenges – both mental and physical – recovering drug users need to rid their bodies of varying degrees of substances and toxins, often through a vigorous program; sometimes they even need to shut themselves out from their lives and loved ones while they recover in an unfamiliar setting. What is much less publicized for those in recovery is the need for nutrition and the development of a healthy eating regimen – an often overlooked, yet crucial step in the process. Is low BMI Associated with Specific Drug Use Among Injecting Drug Users? 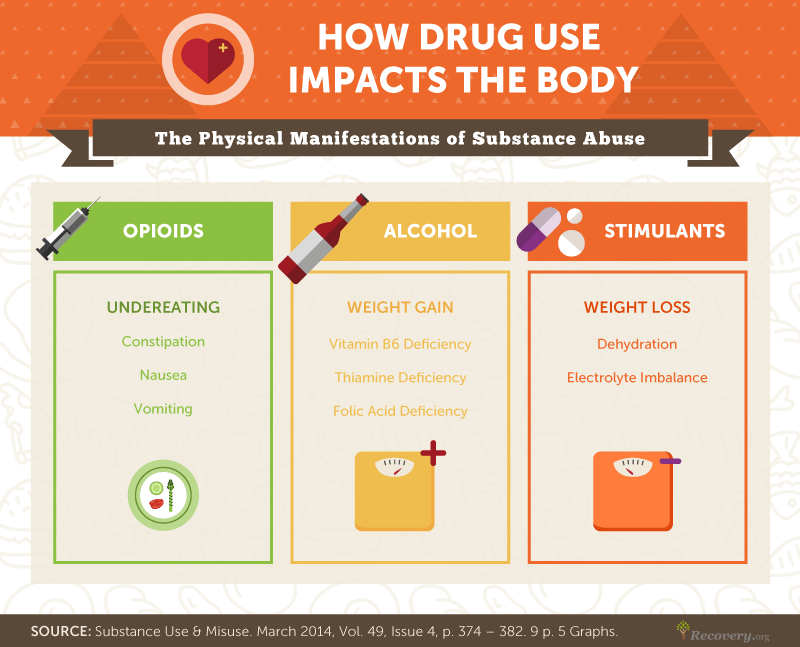 Source: Substance Use & Misuse. Mar2014, Vol. 49 Issue 4, p374-382. 9p. 5 Graphs. Drug addiction harms the body in two ways, according to the U.S. National Library of Medicine. First, the drug directly damages the functions of the body. Secondly, addiction influences habits such as sporadic eating and poor nutrition that impair the body. Which processes are behind this? Opiate and heroin use can be linked to nausea and vomiting, serious organ damage over time, and general neglect of one’s health, potentially leading to nutritional deficiencies. Conversely, users of stimulant drugs such as amphetamine and methamphetamine may experience elevated blood sugar levels and cravings for sugary foods after drug use ends, which can contribute to weight gain or even obesity. bodily side effects may include constipation, nausea, and vomiting. In turn, these symptoms may cause an opioid user to not eat enough or absorb certain nutrients, or to suffer an imbalance of electrolytes such as sodium, potassium, and chloride. Nausea can also cause eating difficulties, which can make many opioid abusers malnourished. Alcoholism is also “one of the major causes of nutritional deficiency in the United States,” according to the U.S. National Library of Medicine. Alcohol damages two major organs associated with digestion: The liver and the pancreas. The liver extracts toxins, and the pancreas manages blood sugar and fat absorption. Damage to these organs sets off an imbalance of fluids, calories, protein, and electrolytes. Alcoholics may derive as much as 50 percent of their daily caloric intake from alcohol, neglecting the foods and nutrients needed for a healthy diet. Alcoholics are commonly deficient in vitamin B6, thiamine, and folic acid; however, they still can gain weight because of the empty calories in alcohol. Good nutrition can be a strong ally on the road to recovery from drug addiction. The right food can not only mitigate drug damage but also help the former abuser feel stronger. It can set off a positive feedback loop to show how ingesting healthy foods – instead of deadly or harmful drugs – will make recovering people feel their best. Proper nutrition can contribute to repairing damaged tissues from drug abuse and can help restore the person to a better mental state, as metabolic and digestive processes are known to be linked to cognitive function and the workings of neurons and synapses. Recovering drug users see improvement in their moods when they eat balanced diets, which often leads to the greater mental willpower necessary to conquer addiction. For instance, the production and use of serotonin, a neurotransmitter that regulates mood, is thought to be promoted by tryptophan and vitamin D, which play a role in serotonin’s synthesis and activation. Each nutrient offers a unique benefit to a recovering substance user. Omega-3 fatty acids, found in salmon and flaxseed, improve mental cognition and have been used to treat patients with mood disorders. B vitamins – found in poultry, eggs, and dairy – might also improve memory, as chronic abuse of stimulants can lead to long-term memory problems. (https://medlineplus.gov/ency/article/002149.htm) Vitamin B12, found in beef and chicken, and folic acid, found in beans, can help prevent mood disorders, dementia, and problems with the central nervous system. Rather than shopping for each vitamin, it’s best to understand the components of a healthy diet. A variety of whole, unprocessed foods with protein, healthy carbs, and monounsaturated and polyunsaturated fats – along with a low sugar and saturated fat intake – will keep the body and brain balanced for recovery. Fish, for instance, is healthy in moderation because it’s often low in saturated fat and high in protein; some fish also contain nutrients like omega-3 fatty acids. Generally, people who consume more fish report lower levels of depression, though experts have contested the exact fish oil or dietary factor that’s responsible. Recovery patients should stay away from certain foods because of their ability to crash a good mood or reinforce pathways to addiction. Caffeine also offers a temporary fix, but is another substance that alters brain chemistry. It hinders the absorption of calcium and can lead to fatigue and a reduced ability to deal with stress, which can impair one’s progress during recovery. Simply for dietary reasons, red meat and processed foods should be avoided. Red meat has been linked to clogged arteries and shorter lifespans. Processed foods are often stripped of the nutrients that are so valuable to a malnourished rehab patient, and they often contain high amounts of sugar and sodium. 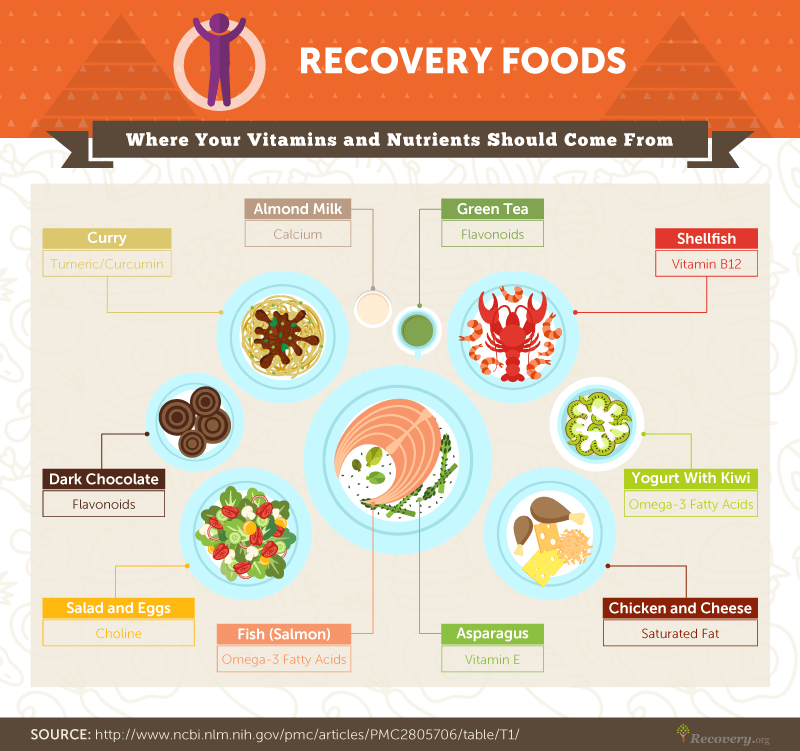 On the other hand, some of the best foods for recovering substance users include whole grains, vegetables, eggs, beans, and fish. Whole grains and other complex carbohydrates contribute to the release of serotonin while also adding fiber to the diet. The body digests them slowly, and as a result, they keep insulin and blood sugar levels from spiking and moods from crashing. Fish offers protein and fatty acids that might help regulate mood. Recovering from a drug addiction requires a strong body and mind. For both to work together, a healthy, well-planned diet will give a former substance user the tools – both mental and physical – needed to repair his or her body and willpower. But nutrition is just one aspect of the self-care that those in recovery need. Beyond eating well, former drug users should exercise, get plenty of sleep, schedule time to relax, and rebuild strong social support systems – including family members, friends, and therapists. Self-care is far from being selfish; it’s a powerful strategy for substance abusers to nourish their bodies and their spirits. If you or a loved one is rebounding from substance dependence, please pay special attention to nutrition and proper nourishment. After all, food isn’t only what we’re made of – it’s also what we’re remade of. 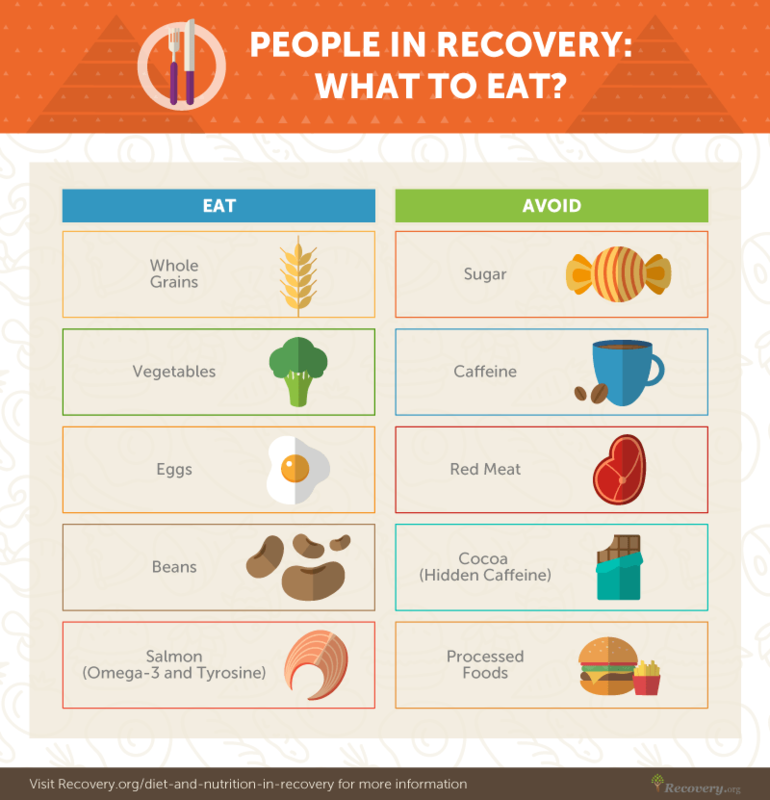 Recovery.org offers resources to guide you through nutrition considerations and can also help connect you to treatment centers that provide holistic programs that integrate wellness and nutrition for recovery. 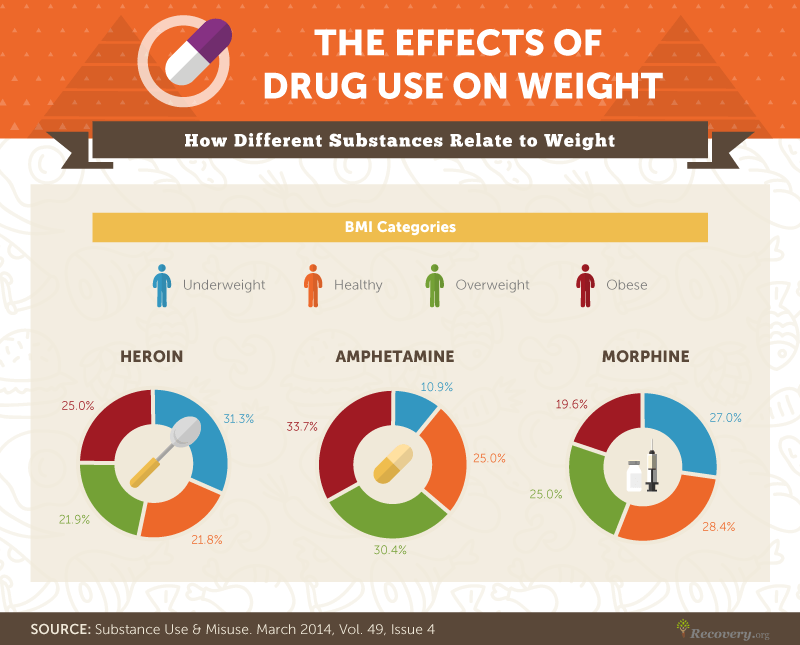 Data on the associations between substance use and body weight were taken from a 2014 study on the body mass index (BMI) of several hundred heroin, morphine, or amphetamine users. Necessary nutrients and examples of dietary sources were provided by a published review of nutrients that are involved in cognitive function. The National Cancer Institute, Harvard Medical School, National Library of Medicine, WebMD, the Australian Drug Foundation, and other published studies also contributed information on the known relationships between dietary habits and health conditions.